Compleat Tube Feeding Formula is made with real food ingredients, including chicken, fruit, vegetables and cranberry juice. 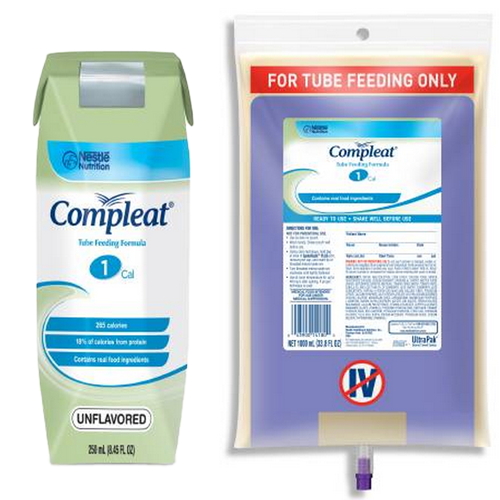 Compleat Formula is designed for patients who desire real food component to their tube feeding. 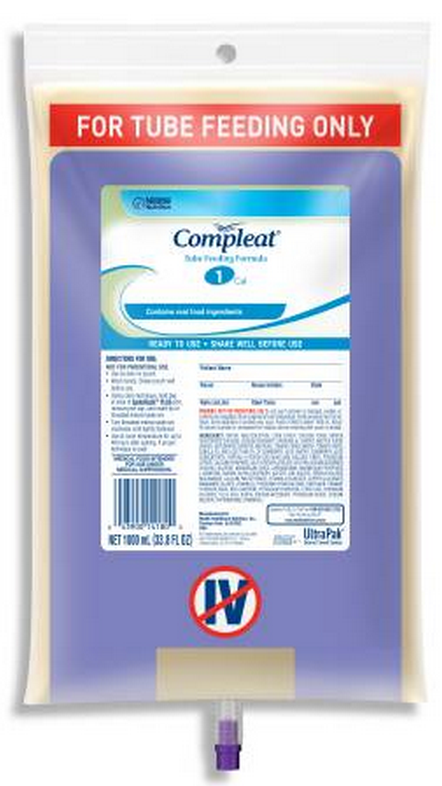 Compleat is appropriate for lactose intolerance and gluten-free diets. (Not for individuals with galactosemia) Compleat is manufactured by Nestle for those who need to augment their nutrition. Made with real food ingredients including chicken, fruit, vegetables and cranberry juice. Contains NUTRISOURCE® FIBER soluble fiber to help support digestive health and normal bowel function. Provides the equivalent of 2 servings of fruits and vegetables. Compleat Product Numbers: 140100, 14180100. 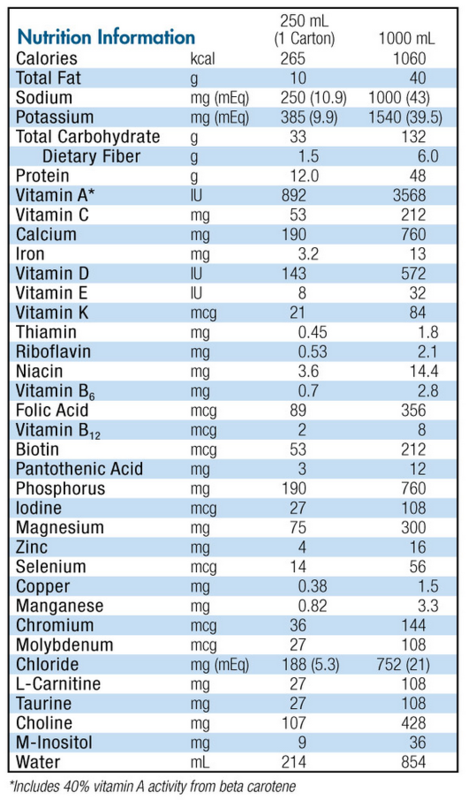 Protein Source: sodium caseinate (milk), chicken. Water, Maltodextrin, Corn Syrup, Chicken Puree (Water, Dehydrated Chicken), Sodium Caseinate (from Milk), Carrot and Pea Puree (Water, Dehydrated Carrots and Peas), Tomato Puree (Water, Tomato Paste), Canola Oil and less than 2% of Cranberry Juice (Water, Cranberry Juice Concentrate), Partially Hydrolyzed Guar Gum (Soluble Fiber), Potassium Citrate, Calcium Phosphate, Salt, Hydroxylated Soy Lecithin, Sodium Ascorbate, Choline Chloride, Magnesium Oxide, Carrageenan, Magnesium Phosphate, L-Carnitine, Taurine, Alpha-Tocopheryl Acetate, Zinc Sulfate, Ferrous Sulfate, Niacinamide, Calcium Pantothenate, Vitamin A Palmitate, Copper Gluconate, Manganese Sulfate, Vitamin D3, Pyridoxine Hydrochloride, Riboflavin, Thiamine Hydrochloride, Beta Carotene, Potassium Hydroxide, Citric Acid, Chromium Chloride, Folic Acid, Biotin, Sodium Molybdate, Potassium Iodide, Sodium Selenite, Phytonadione, Vitamin B12.